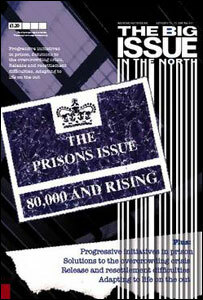 BBC NEWS | UK | Magazine | How much do prisoners get paid? How much do prisoners get paid? David Cameron has proposed that inmates hand over part of their wages to victims of their crimes. So how much are they paid? "All prisoners who participate in purposeful activity must be paid," says Prison Service Order 4460. That means any inmates employed in work, induction, education, training, or offending behaviour programmes receives a weekly rate. That rate is not subject to the national minimum wage (£5.52 an hour), so the weekly wage could be as low as £4. The average is £9.60, usually for a 32-hour week (30p an hour) but their bed and board is paid for. Conservative leader David Cameron has proposed improving prison work so inmates can learn a useful skill, earn more money and make reparation payments directly to their victims. Work under the current system is generally quite menial - sorting out laundry, stitching, cleaning toilets, scrubbing floors - although there may be more interesting work such as gardening, catering or DIY. Some inmates work for external companies, although not directly. For example, Virgin Air pays the Prison Service for some prisoners to repack their headphones. "It's about teaching prisoners that they can do work," says a spokeswoman at the Ministry of Justice. "Pay is an incentive and it's a reward for doing something with your day, other than sitting in your cell." It is entirely the choice of prisoners to earn or not and there are no figures for how many do in total, although the workforce includes 10,000 people in 370 workshops. Those who do work have a special spending account. Wages are paid into an inmate's spending account but there is no cash behind bars so when purchasing food, phone calls or cigarettes, the account is deducted according to the prisoner's number. The maximum an inmate can spend is £33 a week and they are limited as to how much they can transfer from their savings into their spending. 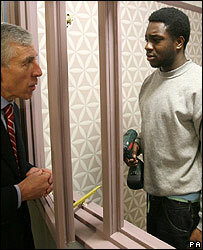 Prisoners are eligible for unemployment pay if they are willing to work but the prison cannot find anything suitable. Deductions can be made to pay for poor attendance or performance, and income tax and National Insurance deductions apply if the normal thresholds are passed. When the Prisoners Earning Act 1996 comes into force, inmates could have part of their pay docked for child support or court payments. Critics, including the Conservatives, say the present system leaves inmates ill-equipped for the real world. They point to a pioneering scheme at HMP Coldingley in Surrey, as an example of more meaningful work. Nine inmates on long sentences have been trained in graphic design and work in a studio called Barbed, producing leaflets, annual reports and cards for clients such as Kentucky Fried Chicken, whom they meet regularly. The graphic designers at Barbed are paid a real wage, pay national insurance and up until recently were able to pay income tax. They have contributed 30% of their gross wages to a special charitable fund and also make voluntary donations to Victim Support every week. The project is run by the Howard League for Penal Reform and its assistant director Andrew Neilson says: "I would be surprised if we didn't see a massive drop in offending because the main reason they reoffend is they can't get work." He says real work with a proper wage increases employability and restores a direct relationship between employer and inmate that prepares them better for life after prison. But he is doubtful whether paying victims is workable and believes paying income tax and national insurance is a better alternative. Evidence of whether Barbed works will come when the first inmate completes his sentence and tries his luck getting a job.